I am so excited to share today’s post with you! This reconfigured space has added so much functionality to our first floor, and as dramatic as it may sound- it has improved our life! If you’re new here, you probably missed my post projecting our plan for the space. While rearranging doorways didn’t work out, we were able to vastly improve the traffic pattern simply by providing a “drop zone” for backpacks, coats, boots, and snow clothes. This space was in sorry shape. Broken bifold doors, cluttered shelves, and only a tiny space to hang coats. Shoes, coats, backpacks and snow gear more often than not ended up piled in front of the laundry machine along with laundry baskets. This left very little room to make your way into the house. From an aesthetic point of view, it was in very bad shape. Old linoleum, textured walls, and dark trim added up to make a depressing space. 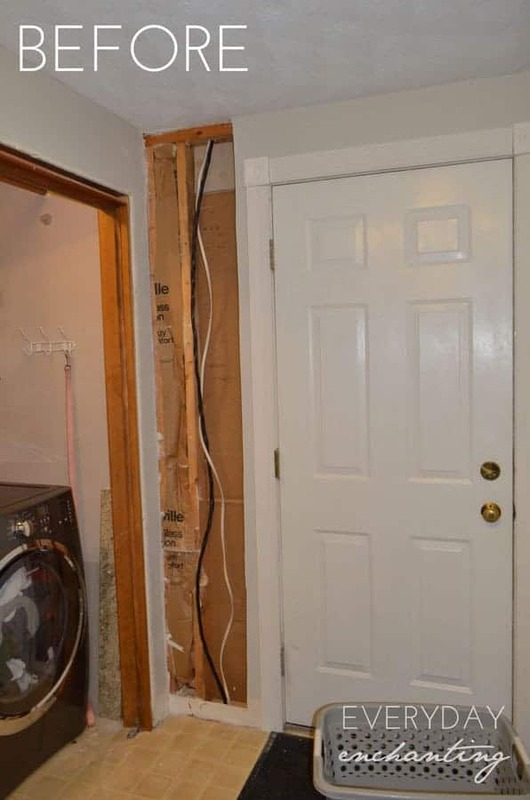 We had to open the wall to wire for the new laundry room upstairs. 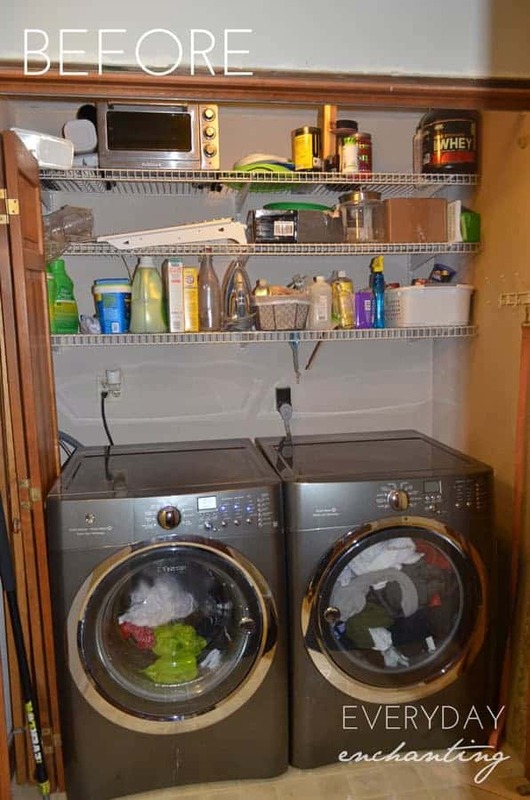 Doing laundry is hard enough, it doesn’t help when it’s an ugly space! It’s hard to believe it’s the same space! The most drastic difference is hands-down the addition of the window. It has provided much needed natural light to the utility hallway. The built-ins provide a perfect space for the boys (and someday Lyla) to hang up their coats and backpacks. We did two levels of hooks, which proved to be a good decision now that they are hauling an extra tote bag with snow clothes back and forth to school. In the summer, hats and mittens can be stored in the handy baskets up above (which I glued house numbers to for fun labels for each of our kids!). I had originally dreamed of “lockers” for the kids (basically the same design but with dividers), but Mack talked me out of them due to the tight space. He was right, the space is ultimately brighter, and the bench is more usable without dividers. And as I always say, his carpentry skills never cease to amaze me. I dream, pin, explain what I want, and draw a rough sketch- and he somehow brings it to fruition! I’m a lucky girl! 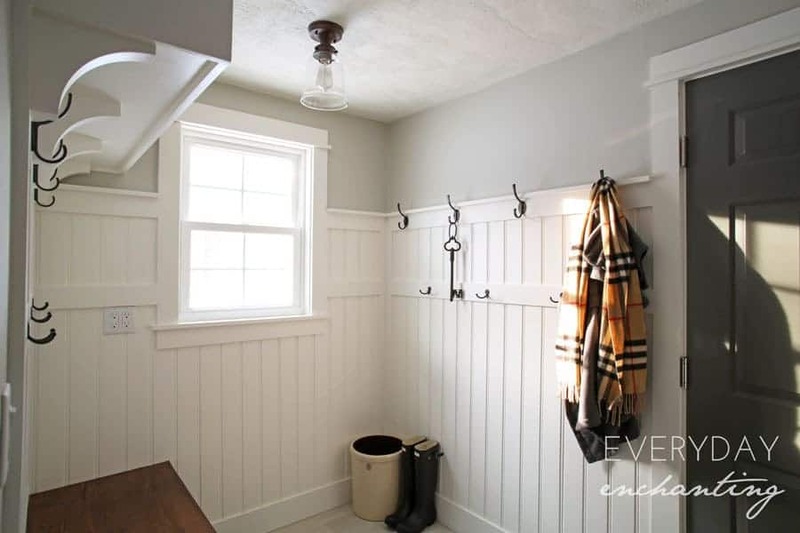 When we were discussing design, I see-sawed between board-and-batten (like the adjoining Powder Room) and beadboard. I decided that beadboard was ultimately the better option, with the added bonus that Mack didn’t have to spend as much time making sure the drywall was perfect on that part of the wall. 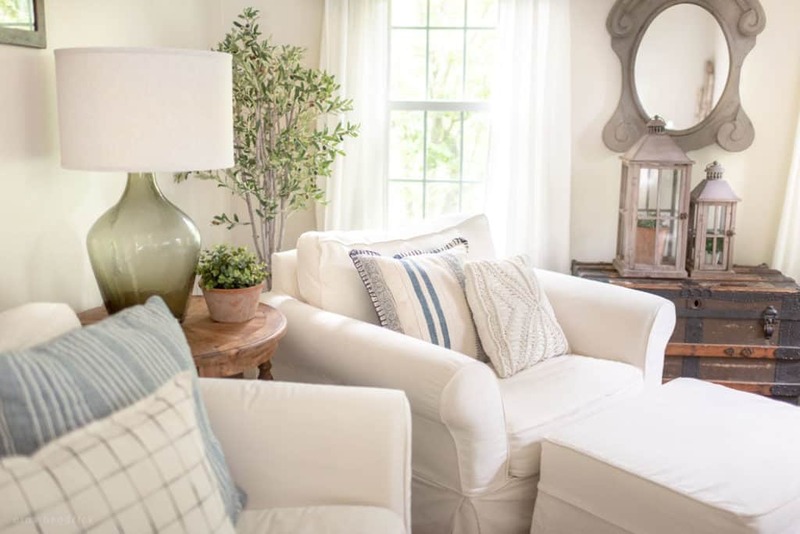 I love the farmhouse detail it adds to the room, and it still ties in well with the rest of our updates, like the beadboard ceiling in the powder room and the pantry. In a separate post I will be sharing the process of building the wall treatment and built-ins and painting with our Homeright Finish Max Pro Paint Sprayer. You’ll also notice we tiled the floor to match the powder room, replaced the light fixture, and painted the existing door rather than replacing it for now (sources and paint colors are at the bottom of the post). I’m still in the process of decorating the room, although I don’t plan on going crazy in here. I’m going to put some greenery in the 5 gallon crock- some sort of tree. I’m searching for a bamboo shade in the right size for the window, and I plan to add some sort of barnwood sign to the sliver of wall. This post contains affiliate links, which are marked with an asterisk (*). We also received a paint sprayer from Homeright, which was used in this project. However, we only recommend products we believe will be useful to our readers. Read more about our policies here. 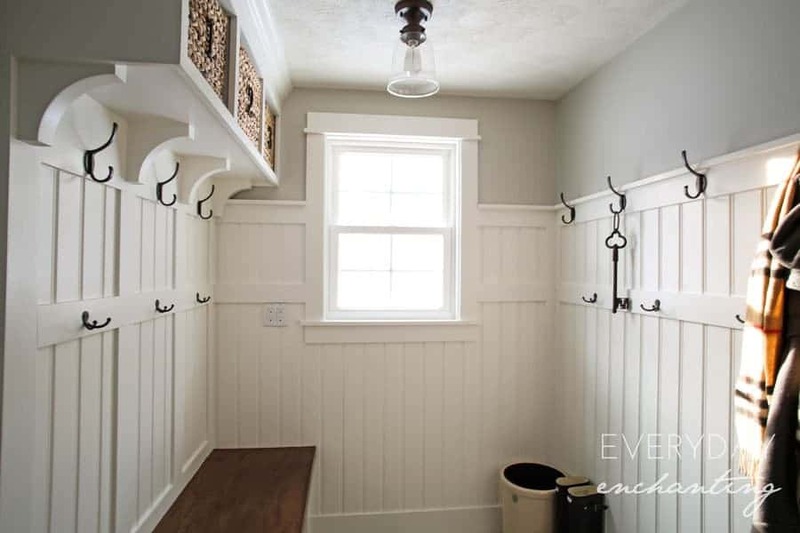 I am experiencing some serious mudroom envy right now! A mudroom is on my list of must-haves in our next home, what with the bajillion backpacks, pairs of shoes, briefcases, etc. You’re a lucky girl! Fabulous job! You guys did an AWESOME job on this update! I wish I could have had something like this when our children were small. It’s a tidy way to organize all of the things that somehow find their way strung out all along the house:) It’s beautiful! I love how the neutral colors just brighten up the entire room. Your board and batten is to die for, great job! It’s absolutely STUNNING!!!!!!!!!!!!!!! I would do this to every space I could in this house – love it. (we have our laundry on the second floor- I can’t imagine lugging the baskets up & down the stairs. So worth it to have it all on the top floor. Great choice! Thank you so much Cait!! :) I’m so happy I inspired you!! Is there a way to turn off your blue header at the top of the page that is always visible? My 15″ screen is too small to see one complete picture with the header showing. Love love this! 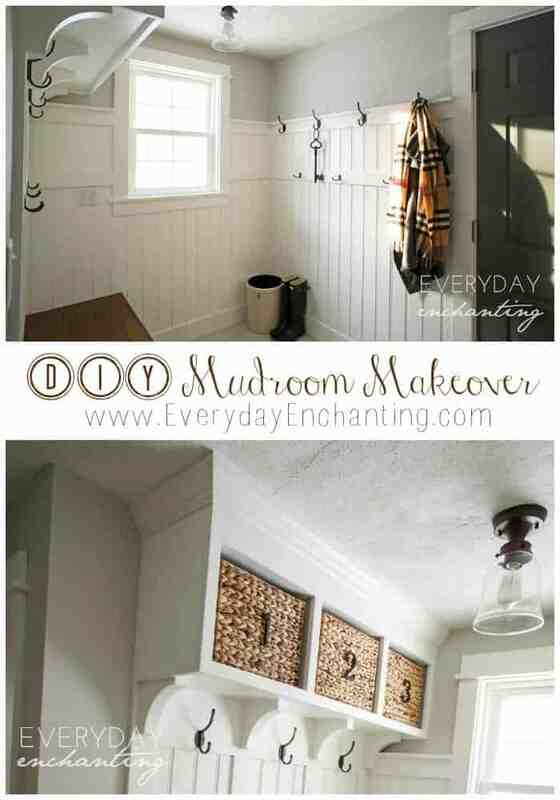 I’m hoping my mudroom transformation happens in the near future & that it will look awesome like yours! What kind of wood is the bench made of? Hi Steph! It’s made of oak planks. I’m sure your mudroom will be beautiful, best of luck with your project! Lovethe grey owl! And the entire make over. Know you must be really enjoying the space. Happy Weekend! 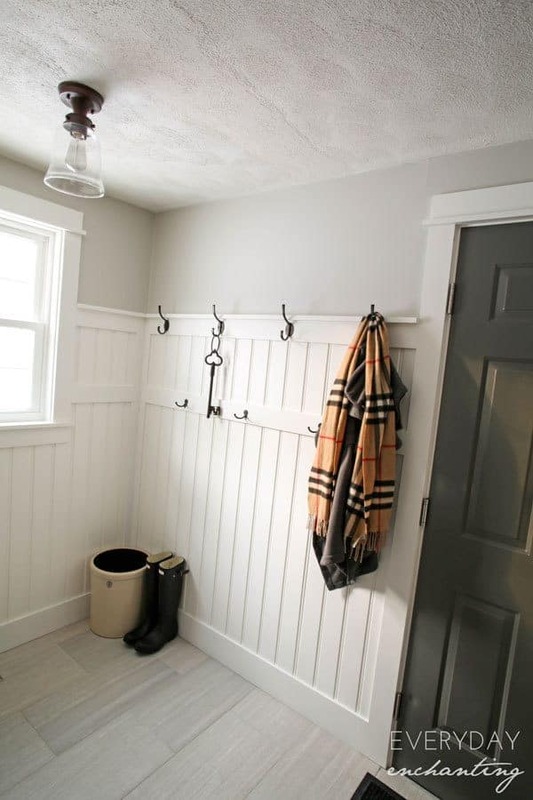 What are the dimensions of your mud room? Hi..I was just wondering if you recall the colour you used on your bench? Beautiful! The stain color or paint? The stain was Minwax Early American and the paint color is Benjamin Moore Simply White. Thank you! I realized after I pushed the send button that I didn’t specify, but yes it was the stain colour, but thankyou for stating both..
Beautiful! 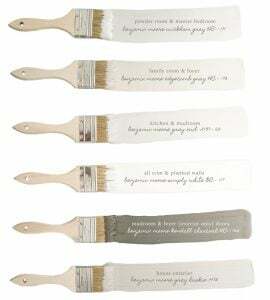 We have a lot of the same colors picked out for our mudroom! The exact same tile, white cubbies, and have dark gray doors (SW Black Fox). Wondering what color grout you went with. The whole room is just beautiful! Hi Abby, unfortunately I am not exactly sure of the name of the color- but it is a gray the exact same color as the tile. Thanks for the reply, Nina! I think we’re going to go with this one, a “warm gray”. Looks pretty close, so we’ll see!